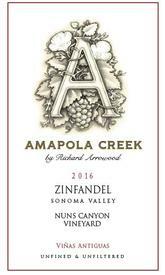 It is known that Winemaster Richard Arrowood has never met a grape he didn’t want to squeeze. Add to that, when you really love a grape like Zinfandel, it is sometimes fun to branch out and try your hand with a different expression of it. The unique character of our 2016 Nuns Canyon Vineyard Zinfandel is derived from more than five decades of winemaking expertise combined with organic farming and Moon Mountain District AVA terroir. The vineyard is named for Hugh Nunn who came over from Scotland in the 1850s and farmed his land near what is known as Nuns Canyon Vineyard. At 1200 - 1500 ft. elevation, this neighboring red, rocky soil vineyard overlooks Sonoma Valley and lays ground for old-vine fruit that gives way to a classic Sonoma Valley Zinfandel with lots of bramble-like attributes. These 60 to 80-year-old head trained vines were farmed organically without herbicides or pesticides and are CCOF certified. The weather during the growing season in 2016 was perfect for wine grapes, largely dry and warm, but not overly hot. We received an abundance of winter rainfall after experiencing five years of draught. The rains were a welcome relief to the thirsty vines and replenishing much needed ground water. The quality and quantity of the fruit were exceptional. We handpicked these grapes September 23th, 2016. The nose on this wine opens in classic California Zinfandel style; big, immediate dollops of ripe red berries overlaying a hint of whipped butter. Stay with the glass, and you will discover deeper fruit characters of raspberry and blueberry, alongside a delicious note of powdered cocoa. Take a sip, and the first thing you will notice is the impressive body of this wine. The mouthfeel is very textured for a Zinfandel, and the tannins are perfectly ripe. The flavors on the palate are darker than on the nose, blackberry jam and fresh plums. Linger for a moment, and you will find the classic brambleberry character of Zinfandel flowing back, leading to a lingering finish of red cherries and blackberry candy.